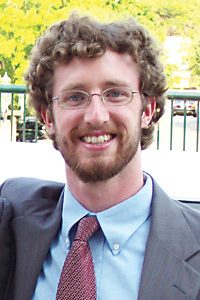 With his face hidden behind a mop of curly hair, a beard, and a pair of wire-rim glasses, Thomas Fritzsche ’09 shies away from talking about himself. But once the topic shifts to immigrant and labor advocacy, the words spill out in torrents. For the past eight years, Fritzsche has worked zealously on behalf of migrant and immigrant workers. Last year he was awarded the Pro Bono Publico by the Public Service Law Network, and he is now a Skadden Fellow working for the Southern Poverty Law Center’s Immigrant Justice Project. Fritzsche discovered the issue that would become his passion almost by accident. “I was just looking for a summer job that involved social justice and that would allow me to practice my Spanish,” he said. So the summer after his sophomore year at Amherst College he returned to his native Maine to intern at the Maine Department of Labor’s Division of Migrant and Immigrant Services. The experience so intrigued him that he continued to pursue internships and jobs for organizations including the Maine Migrant Health Program, the Service Employees International Union, and the National Day Laborer Organizing Network. Going a step beyond his job requirements, Fritzsche has experienced firsthand the life of a migrant farmer. He took a leave of absence from his job as an organizer with SEIU in 2005 to join two migrant farm crews, spending more than three months picking apples and blueberries. He gained tremendous insight. “Growers often falsify the number of hours that you worked so that it looks like you were paid the minimum wage,” he said, adding that protesting to supervisors was difficult. And he now has a clearer grasp of how workers understand their rights and how these rights are enforced. In 2007, Fritzsche was contacted by the Coalition of Immokalee Workers, which has pioneered farmworker rights by persuading large-volume tomato purchasers to make direct payments to pickers to improve their wages. The coalition wanted his help to create an organization to help it gain allies among consumers and organizations promoting organic, sustainable, and locally grown food. In 2008 he achieved this goal, co-founding Just Harvest from Field to Fork. It was this endeavor, supported by letters from two dozen students and faculty, that won over the Public Service Law Network award committee. Copyright © 2010 NYU Law School Magazine. All rights reserved.